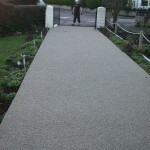 We had our drive coated with your product in 2010 which we are delighted with. You completed the resurfacing of our concrete and what a difference. Unfortunately on Monday 13 August 2012 of this week I noticed that in three places there was a slight lifting of the resin. I contacted your company the same day and explained the problem,. In the afternoon of the same day to my amazement we had a visit from your team who examined the problem and said that they would repair it as soon as weather permitted. On Wednesday same week we had a phone call to let us know the team were on their way and would be with us in the hour, which they were. The problem has been rectified with little disruption and I would like to thank you all for your prompt and efficient service. This entry was posted on Monday, August 27th, 2012 at 6:07 am	and is filed under Concrete, Diary of a Mansfield Resin Driveway Company, Latest News, Nottingham, Resin Bonded Driveways, resin drives, Testimonials. You can follow any responses to this entry through the RSS 2.0 feed. Both comments and pings are currently closed.